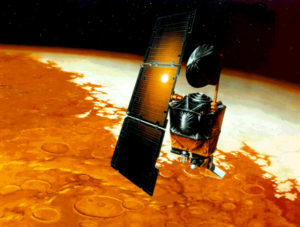 Artist’s rendition of the Mars Climate Orbiter. Image courtesy NASA/JPL-Caltech. A unit is a reference quantity for a type of measurement. For example, when measuring a length, it is not enough to know that an object is 100 long. We must also know the units being used. Is it 100 feet long? Or is it 100 inches, 100 meters, 100 miles, or 100 smoots? It is important that all terms have compatible units when performing mathematical calculations. While we know that 1 + 1 = 2, that equation is only true when the units match. For example, 1 foot + 1 foot = 2 feet but 1 foot + 1 inch = 13 inches. Units matter. The Mars Climate Orbiter Mishap Investigation Board report concluded that the fundamental cause of failure was the use of incorrect units in the software calculating the effects of velocity changes on the spacecraft’s trajectory. According to the software specifications, forces were to be expressed in newtons (N). These sorts of standards are important because variables within software are only expressed as numbers. One piece of software telling another piece of software that the force is 100 can only work if forces always share the same units. This entry was posted in Design and tagged design lessons, NASA, units by brent. Bookmark the permalink. I think it could be a conclusion: when a project get larger, details get more important.